The rollout of Martha's products at Macy's Manhattan store on Broadway is a special one, indeed! 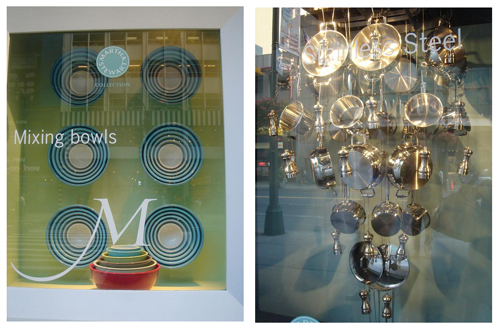 All 36 windows of the store, along Broadway and 34th, as well as all 26 awnings, showcase beautiful displays featuring samples from the Martha Stewart Collection. The windows are sparsely designed in muted tones (so very Martha) and contain lusciously creative arrangements. The cutting boards on display, for instance, are all fish-shaped and appear to be swimming in a school; the stainless steel products are arranged into a chandelier shape and glisten beautifully under the lights. On her Myspace page, Martha expresses jubilation and excitement about the collection, urging NYC visitors to simply stroll by the windows while they're in town for a better look. (They'll be up until September 18th.) She also thanks the staff at MSLO for creating such stunning displays, both inside and outside the store. Seeing these store fronts makes me realize just how lovely it would be to have a stand-alone Martha Stewart store! Wouldn't that be something? 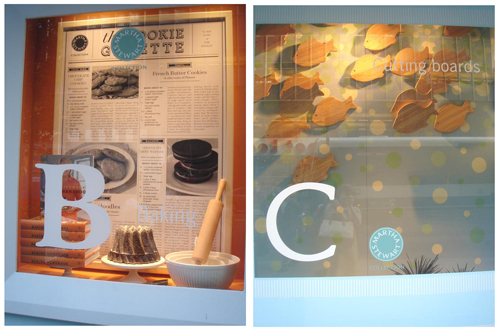 The backdrop in the "B" window is a large newsletter that reads "The Cookie Gazette." I wouldn't mind subscribing! I was in my Macy's in northern CA last weekend, and saw the huge display of Martha's new line in everything from kitchen/tableware to towels and linens. Macy's are really going all out with this,and I hope it is successful for both parties. I don't think Martha's line of craft supplies are doing that well at Michael's, or at least not at mine, where it always seems to be heavily discounted or on clearance. I find it more than a little ironic that it was Martha who really kick-started the whole scrapbooking craze on her old TV show, but now the market has been over-saturated with scrapbooking craft items, and in our town, we even have a several stand-alone stores devoted to such. Anyway, I definitely will be purchasing Martha's new line at Macy's for myself, and as gifts for family and friends. It took her 20 yrs. to get there, but she should have always had a partnership with a store like Macy's rather than Kmart. True, it was a lucrative deal for her at the time, but I felt there was always a credibility issue. It was common knowledge that Martha was never thirlled with her association with the company, and it was a rather forced pairing, and I think it showed.